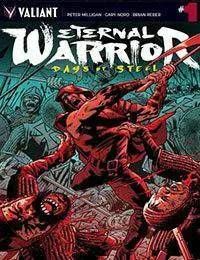 The Eternal Warrior...Gilad Anni-Padda, the Earths Fist and Steel...is forever charged with guarding the Geomancer and securing the Earths safety. After completing another brutal mission, the Earths undying guardian is approached with a cryptic task: find and save a baby - in whose hands might rest the fate of an entire people! But the Eternal Warrior is no nursemaid...and, to complicate matters, a thousand Magyar invaders want the baby dead. At the edge of civilization, can historys most expert killer keep one precious life alive?